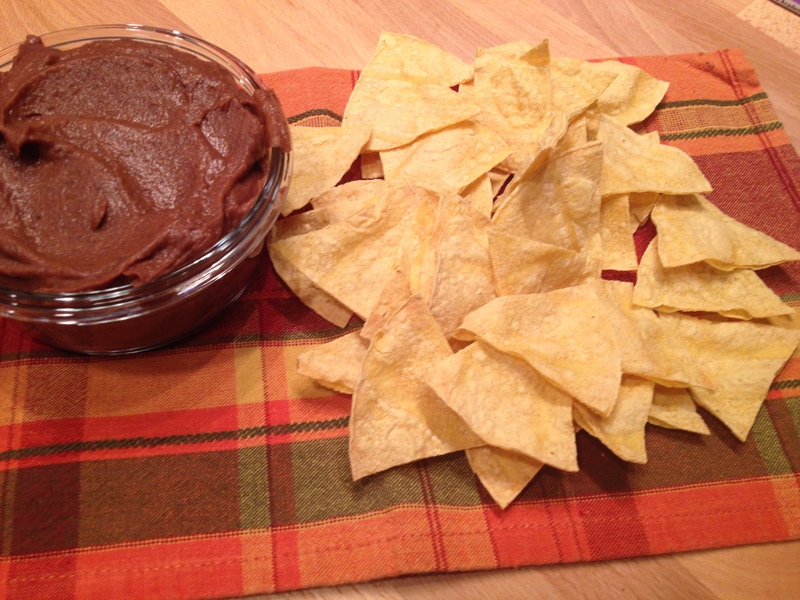 Lets start with the basics – chips and dip. You can make this dip faster than the Patriots (woops, was that last year?) can advance 1 yard (and do the dishes and shampoo your carpets before they are done showing the replays) – Good Old Bean Dip. Just drain one can of black beans and toss in the blender. Add one cup of your current favorite salad. Blend till smooth. Done! And then you need something crunchy to get the dip from the bowl to your mouth. Yes, there are plenty of veggies cut and ready but sometimes life calls for a chip – these no fat-added corn chips are quick, crispy, tasty, and do their job well – getting the dip from the bowl to your mouth! Start with some nice thin corn tortillas. I prefer the ones with the short ingredient list – corn, lime, salt (and that’s it…but have a hard time finding them here.) Using scissors, I cut 3 tortillas at a time – cutting in half, then cutting each half into third. I then spread them out on the cookie sheet and bake in my convection oven at 400 degrees for about 5 minutes (every brand of tortilla will be a little different as ovens will be, so just watch the first time you make them and find the perfect time at your house.) They are ready when they are slightly browned and crisp. Dip and enjoy! Compared to Doritos (nothing against Doritos – I’m sure they’ll have some great commercials today). 28 g of Doritos (but can eat just 28 g …. really?) provide 140 calories, 7 g fat, 18 g carbohydrate, 1 g fiber and 2 g protein. That’s about 13 chips. Three of my Mission corn tortillas (baked) weigh in at 33g (slightly more than the Doritoes) and provide 120 calories (slightly less than the Doritoes) with 24 g carbohydrate, 4.5 g fiber (4 and 1/2 times the Doritos fiber), 3 g protein and just 1.5 g of fat! And that is 18 chips! I think I win the coin toss!